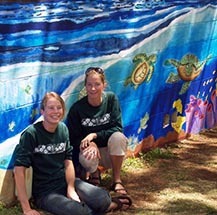 The Lana'i school had several exterior walls which were slated for mural sites for some time with no funding or coordination to get the work done. This project remedied that. The project leaders began the murals with a school assembly that presented a powerpoint slideshow on the history of mural painting and introduced the school mural projects to the youth. Two small walls that are double sided are in the Elementary section of the property. The elementary children brainstormed mural concepts with guidance from the project leaders. The artists designed the four murals based on their collective input. The designs were projected and cartooned onto the walls in pencil. After paint lessons on paper, students were assigned areas to paint which are related to the specific lesson. The Middle and High Schools Students painted three walls which make up a small utility building on campus. The connected walls present Honu's progression and growth from egg, to hatchling, to an underwater swimmer. This mural mirrors the students' growth from the Elementary school to the Middle and High schools onto adulthood. With the help of over 300 students in the Elementary school five community paintings now brighten the campus with color and inspiration. This visual art presentation will help guide students, for years to come, in transitions of growing. Funded in the amount of $2,600 by a generous grant from the Lana'i Community Benefit Fund and a private Lana'i donor! This main page shows preparation steps. Click on any of the buttons below to see each finished mural, along with smiling happy faces of the young artists at work!